In order for a new wolf cub to urinate, its mother has to massage its belly with her warm tongue. The Vikings wore wolf skins and drank wolf blood to take on the wolf’s spirit in battle. They also viewed real wolves as battle companions or hrægifr (corpse trolls). The earliest drawings of wolves are in caves in southern Europe and date from 20,000 B.C. Wolves do not make good guard dogs because they are naturally afraid of the unfamiliar and will hide from visitors rather than bark at them. The autoimmune disease Systemic Lupus Erythmatosus (SLE), or lupus, literally means wolf redness, because in the eighteenth century, physicians believed the disease was caused by a wolf bite. Wolves are the largest members of the Canidae family, which includes domestic dogs, coyotes, dingoes, African hunting dogs, many types of foxes, and several kinds of jackals. Wolves run on their toes, which helps them to stop and turn quickly and to prevent their paw pads from wearing down. Wolves have about 200 million scent cells. Humans have only about 5 million. Wolves can smell other animals more than one mile (1.6 kilometers) away. A wolf pup’s eyes are blue at birth. Their eyes turn yellow by the time they are eight months old. Wolf gestation is around 65 days. Wolf pups are born both deaf and blind and weigh only one pound. Under certain conditions, wolves can hear as far as six miles away in the forest and ten miles on the open tundra. Wolves were once the most widely distributed land predator the world has ever seen. The only places they didn’t thrive were in the true desert and rainforests. Among true wolves, two species are recognized: Canis lupus (often known simply as “gray wolves”), which includes 38 subspecies, such as the gray, timber, artic, tundra, lobos, and buffalo wolves. The other recognized species is the red wolf (Canis rufus), which are smaller and have longer legs and shorter fur than their relatives. Many scientists debate whether Canis rufus is a separate species. Immense power is concentrated in a wolf’s jaw. It has a crushing pressure of nearly 1,500 pound per square inch (compared with around 750 for a large dog). The jaws themselves are massive, bearing 42 teeth specialized for stabbing, shearing, and crunching bones. Their jaws also open farther than those of a dog. The North American gray wolf population in 1600 was 2 million. Today the population in North America is approximately 65,000. The world population is approximately 150,000. A hungry wolf can eat 20 pounds of meat in a single meal, which is akin to a human eating one hundred hamburgers. 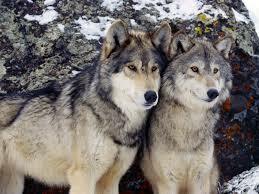 A wolf pack may contain just two or three animals, or it may be 10 times as large. Though many females in a pack are able to have pups, only a few will actually mate and bear pups. Often, only the alpha female and male will mate, which serves to produce the strongest cubs and helps limit the number of cubs the pack must care for. The other females will help raise and “babysit” the cubs. Lower-ranking males do not mate and often suffer from a condition of stress and inhibition that has been referred to as “psychological castration.” Lower-ranking females are sometimes so afraid of the alpha female that they do not even go into heat. An average size wolf produces roughly 1.2 cubic inches of sperm. Wolves evolved from an ancient animal called Mesocyon, which lived approximately 35 million years ago. It was a small dog-like creature with short legs and a long body. Like the wolf, it may have lived in packs. Wolves can swim distances of up to 8 miles (13 kilometers) aided by small webs between their toes. Between 1883 and 1918, more than 80,00 wolves were killed in Montana for bounty. Adolph Hitler (whose first name means “lead wolf”) was fascinated by wolves and sometimes used “Herr Wolf” or “Conductor Wolf” as an alias. “Wolf’s Gulch” (Wolfsschlucht), “Wolf’s Lair” (Wolfschanze), and “Werewolf” (Wehrwolf) were Hitler’s code names for various military headquarters. In the 1600s, Ireland was called “Wolf-land” because it had so many wolves. Wolf hunting was a popular sport among the nobility, who used the Irish wolfhound to outrun and kill wolves. The earliest record of an Irish wolfhound dates from Roman times in A.D. 391. Recent scientists suggest that labeling a wolf “alpha” or “omega” is misleading because “alpha” wolves are simply parent wolves. Using “alpha” terminology falsely suggests a rigidly forced permanent social structure. Biologists have found that wolves will respond to humans imitating their howls. The International Wolf Center in Minnesota even sponsors “howl nights” on which people can howl in the wilderness and hope for an answering howl. Biologists describe wolf territory as not just spatial, but spatial-temporal, so that each pack moves in and out of each other's turf depending on how recently the “no trespassing” signals were posted. In 1927, a French policeman was tried for the shooting of a boy he believed was a werewolf. That same year, the last wild wolves in France were killed. When Europeans arrived in North America, wolves became the most widely hunted animal in American history and were nearly extinct by the beginning of the twentieth century. The U.S. Federal government even enacted a wolf eradication program in the Western states in 1915. Dire wolves (canis dirus) were prehistoric wolves that lived in North America about two million years ago. Now extinct, they hunted prey as large as woolly mammoths. A wolf can run about 20 miles (32 km) per hour, and up to 40 miles (56 km) per hour when necessary, but only for a minute or two. They can “dog trot” around 5 miles (8km) per hour and can travel all day at this speed. The smallest wolves live in the Middle East, where they may weigh only 30 pounds. The largest wolves inhabit Canada, Alaska, and the Soviet Union, where they can reach 175 pounds. Wolves howl to contact separated members of their group, to rally the group before hunting, or to warn rival wolf packs to keep away. Lone wolves will howl to attract mates or just because they are alone. Each wolf howls for only about five seconds, but howls can seem much longer when the entire pack joins in.